Be the first to share your favorite memory, photo or story of Manuel. This memorial page is dedicated for family, friends and future generations to celebrate the life of their loved one. Manuel Chairez Avila was born in Durango, Mexico on March 12, 1942 to father; Reynaldo Chairez and mother; Carmen Avila. 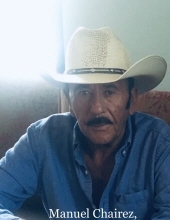 He passed away in Houston, Texas on March 12, 2019. Manuel is survived by his wife; Maria De Los Angeles Palacio Alba, children; Carmen, Sara, Maria, Jose Maria, Reynaldo, Alvaro, Arnulfo & Francisco Chairez. Sisters; Consuelo, Angelita, Benilde, Olga, Elvira, Alicia y Andrea Chairez Avila. Brother; Nicolas Chairez Avila. Grandchildren; Giselle & Jordi Aviles, Anahi & Isaias Lazalde, Jose Zuniga, Juan Herrrera, Marisol, Emilio, Camila, Mariana, Gabriel, Lindsey, Santiago, Jose, Vanessa & Marlen Chairez. Funeral services will be held Tuesday March 19th in the chapel of Cypress Creek Funeral Home. Following the services, the family will honor their father wish and burial will take place in his birth place. Please call the funeral home for more detailed information regarding the visitstion service. Después del servicio, la familia ha decidido honrar el deseo de su padre y transportarlo y enterrarlo en su tierra natal. To send flowers or a remembrance gift to the family of Manuel Chairez Avila, please visit our Tribute Store. The viewing/visitation for Manuel Chairez Avila will begin at 5:00 PM on Tuesday March the 19th. Religious service is scheduled to begin at 6:00 PM. "Email Address" would like to share the life celebration of Manuel Chairez Avila. Click on the "link" to go to share a favorite memory or leave a condolence message for the family.